As a member of a UNL Learning Community, you will be invited to participate in exclusive events and activities only available to LC students. These experiences provide you with opportunities to explore possible majors and career paths, make connections with faculty and staff in your academic interest area, and get to know other first-year LC students. Participation in these outside-of-class events is always voluntary, but we're confident you'll find many memorable, can't-miss experiences! Each Learning Community will host individual events for its members. Examples of possible experiences include behind-the-scenes tours of relevant businesses or organizations, dinners with faculty or alumni, meetings with visiting scholars or presentations by on-campus speakers, academic success workshops, and hands-on activities that are both social and educational. In addition, all Learning Community students will be invited to participate in other program-wide experiences, such as the Fall semester Welcome Event and the LC Study Challenge. In October 2015, the Responsible Design: Architecture, Interior Design, and Landscape Architecture Learning Community participated in a service learning trip to Red Cloud, Nebraska. The trip was led by the group’s faculty sponsor, Dr. Kim Wilson, professor and Director of the Landscape Architecture Program at UNL. Red Cloud was home to Nebraska author Willa Cather, and students were immersed in her history during their stay there - including spending the night in Cather's former home. In Red Cloud, they enjoyed a sunset “picnic on the prairie,” a bonfire with locals, and a Willa Cather-themed scavenger hunt. The next day, students took an architectural tour of Red Cloud, which included the largest round barn in the United States, an historic opera house, and other buildings, in order to experience the place that was so integral to Cather's writing. 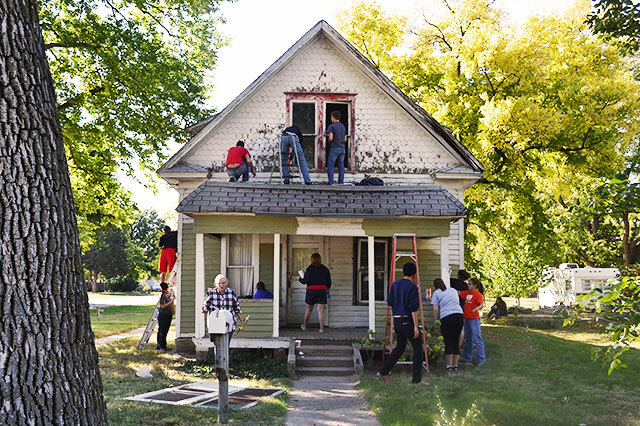 Later, the students volunteered by doing painting and restoration work on one of Red Cloud's historic homes. In March 2016, the Business Leaders and Business Around the World Learning Communities traveled together to Kansas City to tour local businesses and meet with entrepreneurs. During the trip, the students learned about various career opportunities in Kansas City. First, they visited mySidewalk, a civic engagement technology company. During this site visit, the students attended a panel discussion and learned more about the work culture of a modern technology company. Later, the group toured Kauffman stadium, home of Major League Baseball's Kansas City Royals, where they learned about how the business world intersects with sports and discussed how they could create meaningful experiences in college to better market themselves in the future. In November 2015, the Pre-Law Opportunities: Preparing for your J.D. 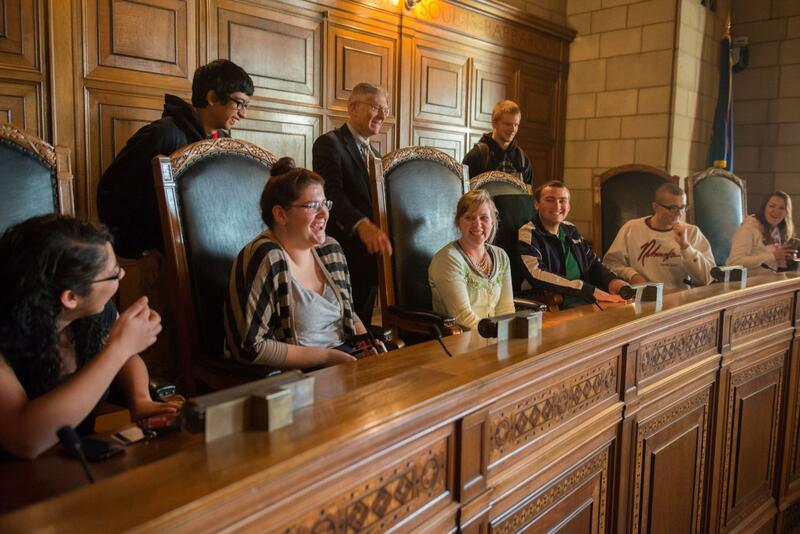 and Beyond Learning Community toured the Nebraska State Supreme Court with their faculty sponsor, Tracy Warren, Assistant Dean of Admissions at UNL’s College of Law. During a private Q&A with Chief Justice Michael Heavican, the students learned about the role the state’s highest court plays in the judiciary system, what it takes to become a state Supreme Court judge, and what they should expect, should they ever appear before the court as a lawyer. They even got to enjoy the view customarily reserved for the Justices, sitting behind the bench! Many students interested in the life sciences have to wait years before gaining practical experience. However, the Biological Sciences: Research on the Cutting Edge Learning Community offers students a unique, hands-on experience with dissection. During the Fall 2015 semester, the Biological Sciences LC students participate in an exclusive seminar taught by faculty sponsor Dr. Gwen Bachman, Associate Professor in the School of Biological Sciences. Throughout the semester, students read and discuss cases from the book "The Deadly Dinner Party," using science to solve medical mysteries. The semester culminates with “Roadkill CSI,” an activity in which the students dissect roadkill collected by Dr. Bachman to practice life sciences skills and attempt to identify other biological conditions the animals may have had. In October 2015, the Exploring Nursing Learning Community traveled to Omaha, Nebraska for a behind-the-scenes tour at the University of Nebraska Medical Center. During this tour, students learned about the simulations used in UNMC's College of Nursing, and got to try some of them out. They also toured the Trauma Unit with ER nurses and met with a flight nurse, who let them climb aboard an emergency helicopter and see what it's like to provide medical treatment high above the ground.